It’s been 15 years since Wes has been back to the desolate land of his childhood. Now he finds himself up against the U.S. military, the local police, and someone who is tracking his every move. In the moments he spent with the dying pilot, Wes discovered something that could get him killed. But while he tries to untangle a web of lies and secrets surrounding the crash, another danger is stalking him. And this one he will never see coming. 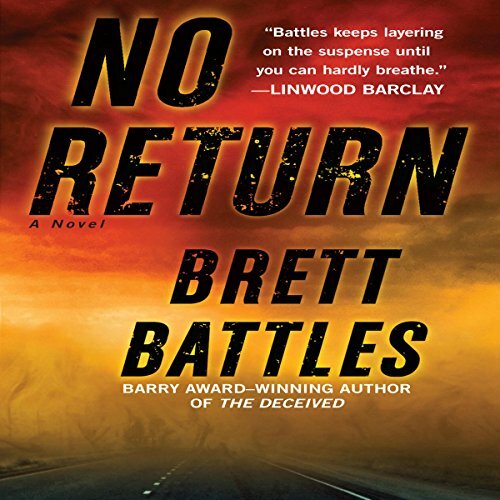 No Return is set in the desert town of China Lake, California where Brett Battles grew up and where a Naval air base is located. The major plot line is about a plane that crashed near the town with the pilot being misidentified by the Navy. The subplot is about a death that occurred in the town while the main character was growing up there. As usual with Brett Battles the characters are well developed and the story has lots of suspense. The narrator is Scott Brick who also narrates Brett Battles entire Jonathan Quinn series. Scott Brick is one of many excellent narrators, and he happens to be my favorite. In addition to the Quinn series, Battles has another great series named Project Eden which is narrated by McLeod Andrews, another excellent narrator. He also has the short Logan Harper series which is not as good as well as being co-writer of the two book Alexandra Poe tseries which I find disappointing. One of the really nice aspects of the the more recent Battles novels that are narrated by Scott Brick is that they end with a 15 to 20 minute interview of Battles by Brick. That is true of No Return. I highly recommend No Return for those who like thrillers. Would you consider the audio edition of No Return to be better than the print version? What other book might you compare No Return to and why? This book was enjoyable on so many levels. It was suspenseful and had some surprising twists. Excellent book for long trips or monotonous housecleaning! If you could sum up No Return in three words, what would they be? Yes. The character who practiced Eastern medicine made the predictable zig-zag because his character was so enigmatic. Probably. I listen to many books. I found that this one was hard to turn off, so yes. I loved the blending of cultures, the strength of the characters, and that the female protagonist was not the cliche warrior princess. Something about the development of this character made her feel unusual. Each character was strongly developed and strongly distinguished by the narrator. This Brett Battles guy, well, he has some interesting action story ideas. He throws in some curves and some twists and turns. It's fun reading. However, his characters are just plain dumb. The way they interact and the conversations they have are cringe worthy. I'm a sci fi nut. You can convince me most anything is real, but in no universe or alternate reality do people make conversations the way Battles writes them. I'm not saying don't get the book. It's an easy listen, mindless action story. Just be prepared for the ridiculous dialogue. Too bad because if he would get help with character development, he would be an awesome writer. The great multi-layered plot starts with a plane crash and ends with a fantastic character-driven twist. The audiobook has a cool interview with Brett Battles at the end. In it, Brett talks about part of his real-life inspiration for the book. An event from his childhood that knocked around in his imagination for years until he was ready to put pen to paper. It's a great insight into a compelling plot and glimpse into the motivation for this great book.